Twenty-one SDA-NP chapter members created a group installation to complement their “Surface Design at the Carnegie” show at the Port Townsend public library. Letters of the alphabet hung from the ceiling near the front desk. Each letter is unique and displays a diversity of artistic expression and technique. Letters were felted, knitted, crocheted, embroidered, quilted, collaged, beaded, hand sewn and embellished with a wide variety of mixed media. Following their debut at the PT Library, SDA-NP member continued to create letters for an installation in the Port Angeles branch of the North Olympic Library System. Forty-three letters celebrate the diversity of our work in fiber. Many of the letters where created in memory of a loved one and held special meaning. 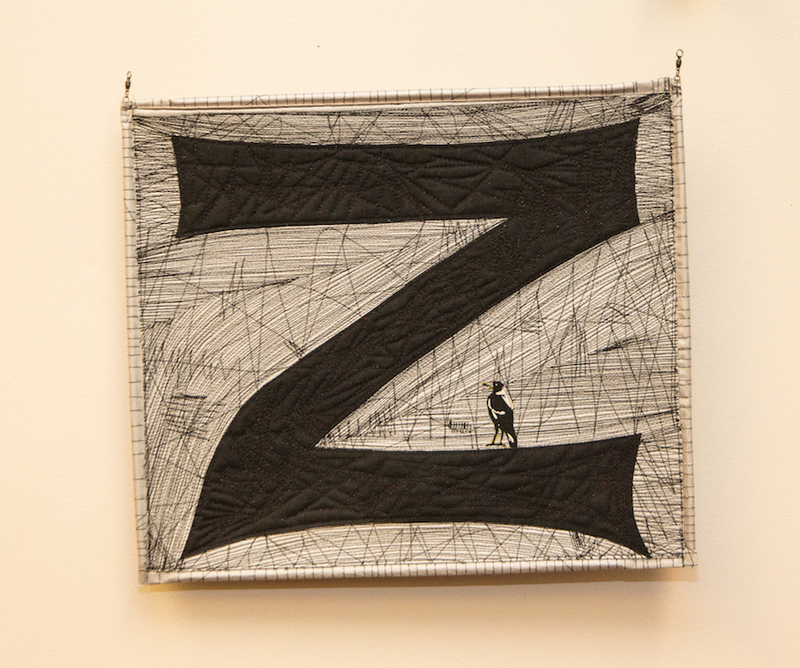 Pat Herkal's embroidered and beaded letter “R” was created in memory of her daughter Rita and her grandmother who taught her to embroider when she was five. And with gratitude for her boisterous bright granddaughter Rowan who channels her Auntie Rita. Mary O'Shaughnessy created letters “D, M, O, from flags of the seven chakras, with acupuncture needle covers embellishing them. It is to honor her niece Michelle, a Doctor of Oriental Medicine who was dying from cancer. Anne Jarnazin's soft sculptured “E” and an intriguing mysterious crow embellishing “Z” are the initial letters of her daughters names.